The website use third parties to analyze data navigation, Check relationship with third party cookies policy..
Google Analytics cookies. Generate an anonymous user ID that is used to count how many times a user visits the site. Was also recorded when the first and last visit to the web. It calculates when a session is over, home user and keywords. YouTube may place cookies on your device if you watch videos from YouTube on our website. 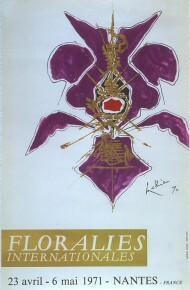 Candidates, exhibitors, members of the Floralies Committee, create and access to your personnal space. Enter the Floralies giveaway on our Facebook page ! 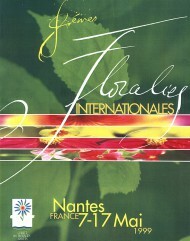 The 12th edition of the International Floralies - Nantes will take place May 8th to 19th, 2019. "If life is nothing more than a passage, let's at least sow flowers along it. 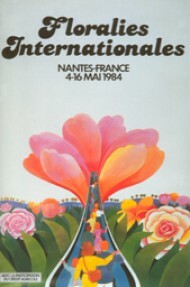 The international Floralies - Nantes are a prestigious flower exhibition which has been taking place every five years in Nantes since 1956. Each exhibition attracts over 200 ornamental exhibitors, professionnals or amateurs from the flower and plant industry from France and all over the world. Selected for their professionalism and "know-how", they have a common passion for horticulture, landcape architecture, design and botanics. Every five years, creation and landscape arrangement meet during 12 days in the exceptionnal surroundings of the "La Beaujoire" park, alongside the"Erdre", the most beautiful river of France according to King François the 1st. Hundreds of thousands of visitors helped the International Floralies - Nantes raised to the first French floral show and among the most prestigious European floral events. A non profit organization created in 1943, by a group of volunteers all active in various types of horticultural associations. 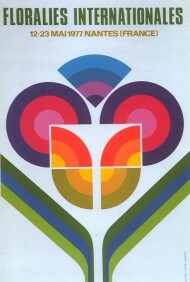 Organizer of the International Floralies-Nantes, the Floralies Committee work with passion and conviction. Member of "the International Floralies Association", the main mission of the Floralies Committee is to promote the richness and diversity of the plant world, to contribute to its fame and to put its knowledge to the understanding of everyone. 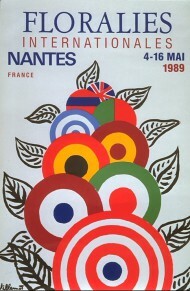 It represents the colors of the French plant, the image of Nantes and its region all around the world. 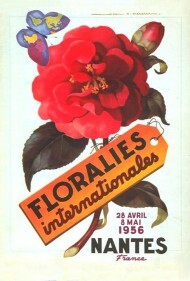 Over 70 years ago, many structures, both amateurs or professionnals, acted together to promote horticulture within the "Comité d'Entente des Organisations Horticoles et Maraîchères", which became soon after the "Comité Horticole et Maraîcher de Loire-Atlantique". Elle contribue à développer la passion de l’art floral, des jardins et des plantes décoratives, potagères et fruitières auprès d’un public de plus en plus ouvert à la nature. La Fédération des Groupements Maraîchers Nantais est à ce jour, le seul syndicat professionnel agricole départemental regroupant uniquement des producteurs de légumes. Adhérente de la Fédération Nationale des Producteurs de Légumes, elle-même association spécialisée de la FNSEA, la Fédération des Groupements Maraîchers Nantais tient son indépendance locale de son ancienneté et aux particularités du maraîchage nantais dans l’espace agricole départemental. 400 exploitations maraîchères dégagent un chiffre d’affaires de plus de 200 millions d’euros, soit 20% du chiffre d’affaires agricole du département. La surface maraîchère en Loire-Atlantique est d'environ 5000 hectares, soit 1,2 % de la SAU du département (412 900 hectares). Le Maraîchage Nantais représente près de 4000 emplois (1700 permanents en CDI + 2300 Équivalent Temps Plein (ETP) saisonniers), soit 29 % de l'emploi agricole du département (14000 ETP). À l’origine en 1886, la Société des Horticulteurs de Nantes est un syndicat professionnel regroupant bon nombre d’horticulteurs nantais. 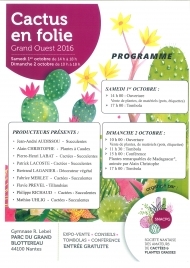 La Société des Horticulteurs Amateurs de Nantes et Région se donne aujourd’hui pour objectifs la promotion du jardinage et le respect de l’environnement, encourageant et développant l’éducation à la nature, le respect de la biodiversité, la connaissance des végétaux, les techniques du jardinage, la décoration florale et l’art du bouquet. Cotisation pour l’année (de septembre à juin) : 17 euros, donnant droit à la distribution de plantes, fleurs et autres lots à chaque réunion mensuelle. 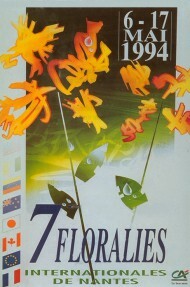 Réunions “Florimatinales” le 2e dimanche de chaque mois, d’octobre à juin. 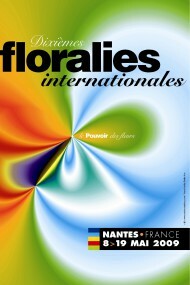 The quality and success of the International Floralies - Nantes have made it a "must-see" in a world famous meeting place. In order to maintain this prestige, the Floralies Committee works hard on its presence to many national and international events. Shanghai - China - "La Tour Lu"
Since 1956, the International Floralies - Nantes welcomed over 3 million accumulated visitors and over 60 countries has been represented at least once at the event. 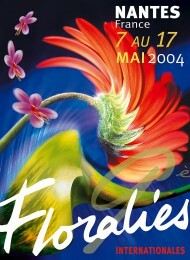 Every edition of the International Floralies - Nantes has its own special theme. "Flowers to live by" will be the one for the 12th International Floralies - Nantes, taking place from May 8th to 19th, 2019. 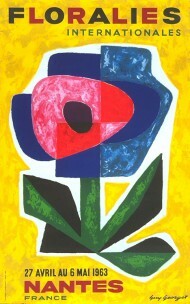 Theme : "Bouquet of Arts"
Place : the Exhibition Park of "La Beaujoire"
Theme : "the Power of Flowers"
Theme : "Symphony of light"
Theme : "Europe in Flowers"
Theme : "Flowers in the City"
Theme : "Woman and Flower"
Countdown is ON! In one year exactly, the 12th edition of the International Floralies - Nantes will open its doors and will be welcoming visitors for 12 days of ornamental and plant-related magic on the them "Flower to live by". The date is set, see you on May 8th, 2019 ! The 12th edition of the International Floralies - Nantes will be taking place in May 8th to 19th of 2019. The Floralies Committee, organizing the event, unveils the Event side of the website. This space allows visitors to know more about the upcoming edition, to purchase tickets, to get to know the official event partners and get all the practical information. Don't hesitate to browse through the site and sign up for our updates so you don't miss ou on any news about the Floralies 2019. Organizing an event: business seminar, meetings, wedding, reunion...? Looking for the right place? Rooms at the heart of the city center of Nantes, in a nice environment, offering privacy and adaptable to your needs. You have an event to organize, we have rooms to welcome you in. Find our offers on the "ABC Salles" website.